At the end of each week, I like to show a quick round-up of what's been going on in my corner of the world. Some of this includes what I've previously shared on social media, some of it was simply stowed away on my camera roll. As an addition to this weekly review, I'm going to start adding a few inspiring, funny, or interesting links that I found during the week at the end of the post. Let me know what you think of the addition. Over the week, I worked with altering leather for The 100 Day Project. 48: This first piece proved to be a real test of my patience. I originally was going to do the cuff I made on day 51, but the snaps I had weren't right, so I had to use another piece of leather. I was happy to have learned to add snaps to leather at least. From there, I wanted to add the Tim Holtz tag, but riveting it on took me MUUUUUUUUUUCH longer than I had anticipated. I was determined though and finally successful! And, I really like it too. It's a shame I've since lost it in the craft room. Seriously, I've been searching for it all week. It's just...gone. 49: A belt that's been in my stash forever was the base for these earrings. I think cutting out the shapes so they somewhat matched was the hardest part. 50: This was the other leather belt I have on hand. I used the embossed tin piece I made for day 19, using eyelets to rivet it to the leather. 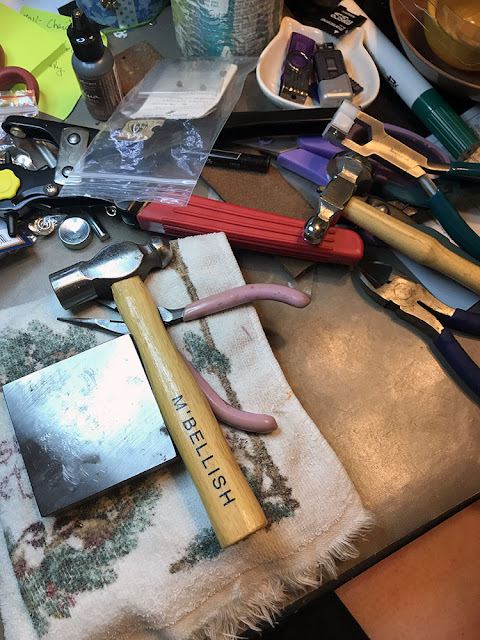 51: I was able to pick up the right size snaps for that leather belt and quickly add them to make it a cuff. It needs some finishing touches, and I need to work on where to position the snaps, but I totally dig this upcycle. 52: I awoke with a design similar to this result in my head. It was just a matter of executing the use of leather, eyelets, and beads to get the desired result. 53: This project should have been a snap to make. But, I learned that I really should think through designs before adding permanent glue. It came out fine in the end. 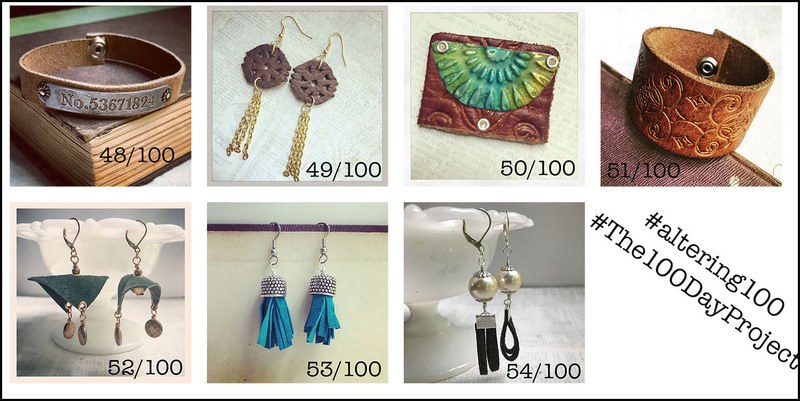 54: My beading friend, Divya of Jewels of Sayuri, shared a great tutorial that included leather and ribbon crimps. She totally inspired me to do something similar. Sunday was completely consumed with making that bracelet. I used ALL THE TOOLS to try to get it to work. Monday was a full day that started with some gardenia admiration. Y'all! I can't get enough of these. Leeloo was up to her own antics...yup - that's toilet paper pulled from the master bath, through our bedroom, and into the craft room. Yay! 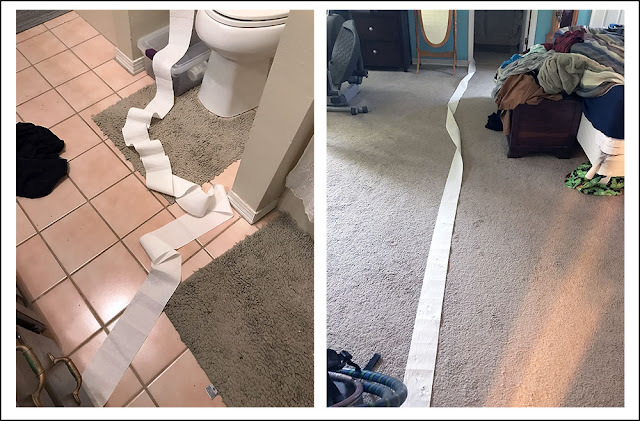 It wasn't near as fun to roll it back up. Luckily, I was able to recover by having lunch with a friend. 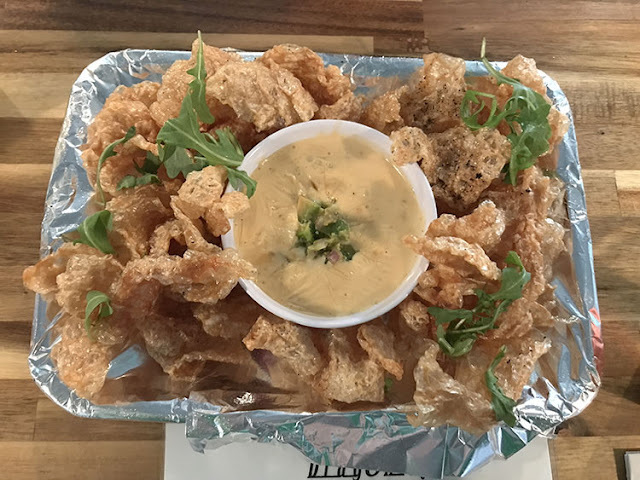 We almost completely devoured these fried pork skins and queso at Dragonfly Foodbar. Don't judge - they were SO GOOD!! 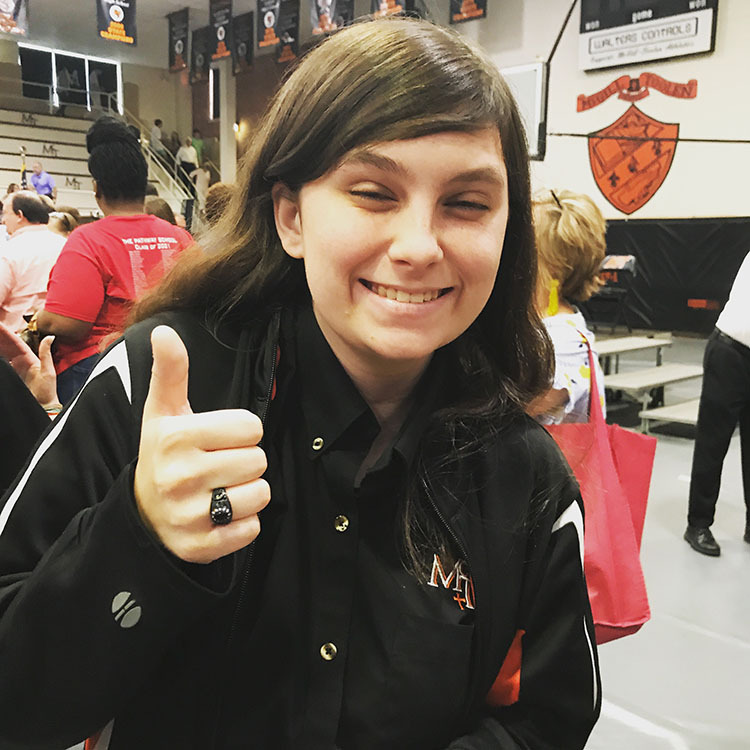 On Tuesday I got to feel super old as my oldest niece received her class ring, signifying her becoming a senior in high school. Super old. 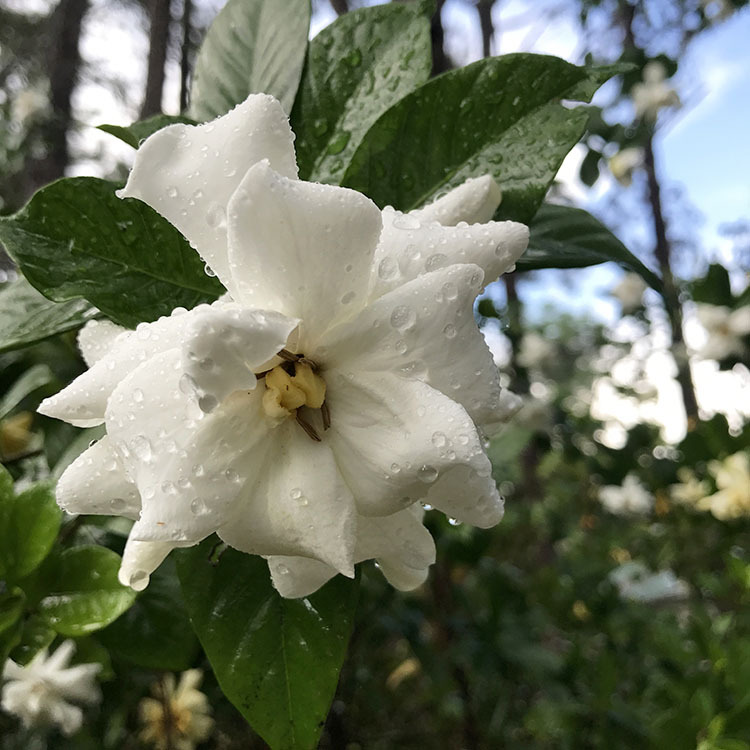 On Wednesday, I admired the gardenias again as they were gloriously still dripping from a rain shower. There were other flowers to admire this week as well. The zinnias I planted forever ago have finally begun blooming. Now to wait for the sunflowers and see if the daisies ever show up. We had a ton of wildlife visitors this week. I found a baby Scarlet King Snake just under the lid of the pool skimmer. He startled me, but he's a "good snake" and not dangerous at all. We've had bunnies in the yard all week. They're so skittish, this was the best photo I could get of them. And, yesterday these baby armadillos emerged from under the porch. (I had an inkling that there were babies about.) Seriously y'all, it's the armadillos that are the biggest nuisance of these three. While they are great at eating the ants, they leave holes all over the yard. And, I'm prone to tripping in those holes. We're going to have to do more catch and release. It's a three-day weekend here in the States for Memorial Day. Here in South Alabama, we're waiting for Tropical Storm Alberto and expecting wet conditions all weekend long. During one of the showers yesterday, I pulled out my newest supplies to try more acrylic paint pouring on my own. 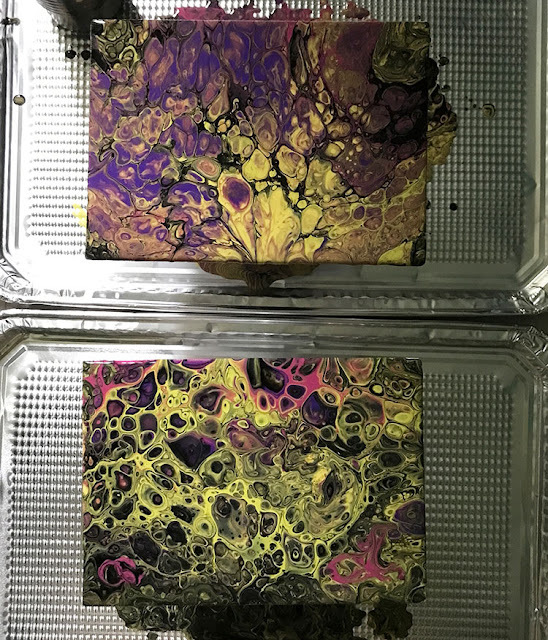 I went with a dirty pour method. The above canvases are still wet in the photo, but I'm absolutely loving the process. You can bet I'll be sharing more about it later as I experiment and learn. Made Urban has an article on Where to Sell Handmade Crafts Locally. You may be familiar with the options they mention, but it's a nice reference to have on hand. 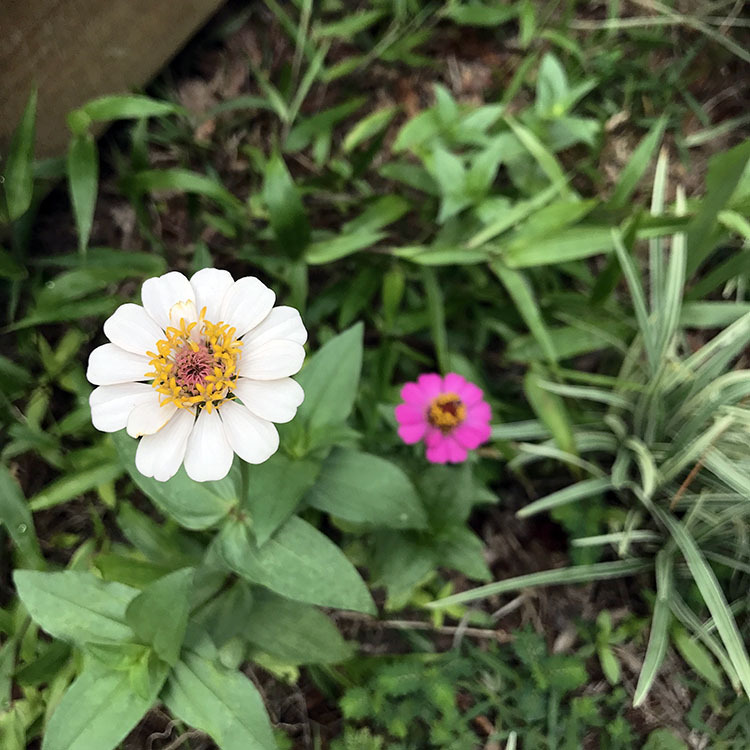 Suzanne Walcher wrote on The Grace Notes Blog for Bella Grace Magazine a post about "The Other List" that is made up of simple joys and happy actions. I adore this idea. I hope you do too. That's the week for me. We actually have a reprieve from the storms for a while today, so I'm hoping to have a bit of outside time. But first, to figure out what my altering focus for the week will be. Hmmmm..... Any suggestions? Yes, the leather was a blast. I seem to be struggling to find other materials to use and alter in this project. But, I'll find a way to make it work! As for the wildlife, the bunnies aren't a problem at all. They leave little poop piles all over, but that's about it. Ha! So glad you don't mind the links. Yay! You're very welcome! I'm hoping to do more paint pouring practice before I share what I've learned. This week's project has been mostly about testing out different ideas and colors and whatnot. I live on five acres out in the country. We love most of the wildlife, but the armadillos make it hard to love them. What a full life of creativeness you have! 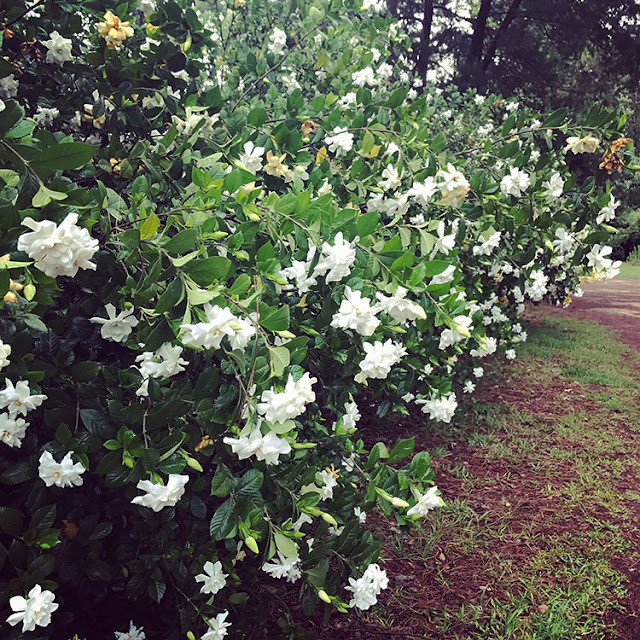 Your gardenias are beautiful, and the pork rinds are making my mouth water. I had them as a appetizer at Dumbwaiter, but I'll have to try Dragonfly's version next. I didn't even know they had them. Leather cuffs are so sassy and cute! Hope you have a great long weeked! Leslie Anne, I try to do something creative everyday. Sometimes that doesn't work out, but I think about it! I still haven't been to Dumbwaiter yet. Looking forward to trying it out soon. Dragonfly's was a special on their chalkboard. They do have 3-way pork as an appetizer, but this wasn't it. Thanks for dropping by. I'm having some issue with my comment moderation that I'm hoping can get fixed soon. I think it has to do with all the new regulations and changes the websites are making. It makes my head spin! I hope you see this!